In the National Competition, the 29 films offer a kaleidoscope of the latest national short films produced in Germany including the German premiere of SEALAND by Till Giermann from Dresden. In ARE YOU LISTENING, MOTHER? from Tuna Kaptan (2018), a Kurdish mother deliberately crosses the border the electronic ankle bracelet she is wearing should prevent. A voiceless male figure is found in Hannes Schilling’s THE PROBAND (2018): Too proud to give up the dream of owning his own home, the unemployed Domenique puts his life at risk due to money problems. Hannes Schilling already came to Dresden in 2018 with AFTER THE PARTY, for which he also received a German Short Film Award nomination. This year, Filmfest Dresden is again welcoming an array of festival alumni with their latest productions: Dennis Todorovic (2004 with AMOR FATI) is showing in his music video TUTORIAL how actresses master the art of fake tears. Sonja Rohleder, who was awarded the DEFA Promotion Prize in 2014 for WALK THE DOG and who created the festival trailer in 2017, is represented this year with her 2D animation QUIET. Likewise, two former members of the youth jury in the National Competition have works in the program this year: Steve Bache with his short film THE CAPTAIN and Rebecca Meining, who was DOP on Eileen Byrne’s WHAT REMAINS. 47 films from 37 countries are being screened in the International Competition, including 22 animated films. The crossing of a traditional border is undertaken, for instance, by the protagonist in Abinash Bikram Shah’s TATTINI (2018, Myanmar, Nepal), who has a fallout with her entire village because she insists on getting her inheritance although she is not entitled to it as a woman. The audiences are confronted with all possible forms of sexuality in the garish Russian animation LAVO (2017) from Sasha Svirsky. 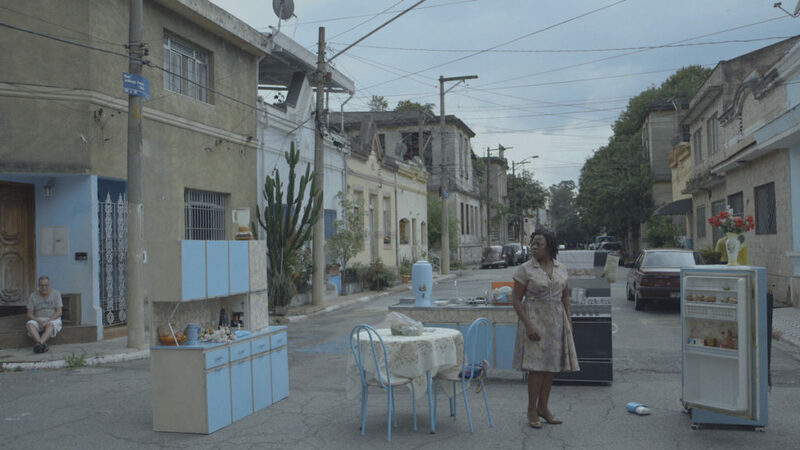 In AZUL VAZANTE (2018, Brazil), the director Julia Alquéres explores gender roles and transsexuality on a fine line between the fictional and the documentary. Likewise, the hybrid works ONDES NOIRS from Ismaël Joffroy Chandoutis (2017, France) and THE HYMNS OF MUSCOVY (2018, Russia) from Dimitri Venkov play with formal-aesthetic crossings of borders. Two films take a creative approach to the horror genre: THE BOOGEYWOMAN (USA, 2018) from Erica Scoggins, which is celebrating its world premiere at the 31st Filmfest Dresden and REAL GODS REQUIRE BLOOD from Moin Hussain (Great Britain, 2018). Also in the International Competition, the audiences can expect several old friends as well as some big names: Michael Frei, who received a “Golden Horsemen” in 2014 for PLUG & PLAY, is presenting his brand-new film KIDS (2019), which was premiered at this year’s Berlinale. A further returnee is Aggie Pak Yee Lee, who guested in the International Competition last year with MUTEUM and is represented this year with her animated film FIVE STEPS TO THE RIGHT (2017, Estonia). Apichatpong Weerasethakul from Thailand is an internationally recognized director and artist of exception, not least since he won the Palme d’Or award in Cannes (2010, Uncle Boonmee Who Can Recall His Past Lives). In Dresden, his short film BLUE (2018, France) is being screened this year. With ACCIDENCE (2018), a further work by the renowned Canadian filmmaker and artist Guy Maddin is running in the International Competition section of the 31st Filmfest Dresden. And the audiences can even look forward to seeing an Oscar candidate with Jeremy Comte’s FAUVE (2018, Canada).